I think I can, I *still* think I can. Repeat. Things are progressing in the girls' room...slowly but surely. 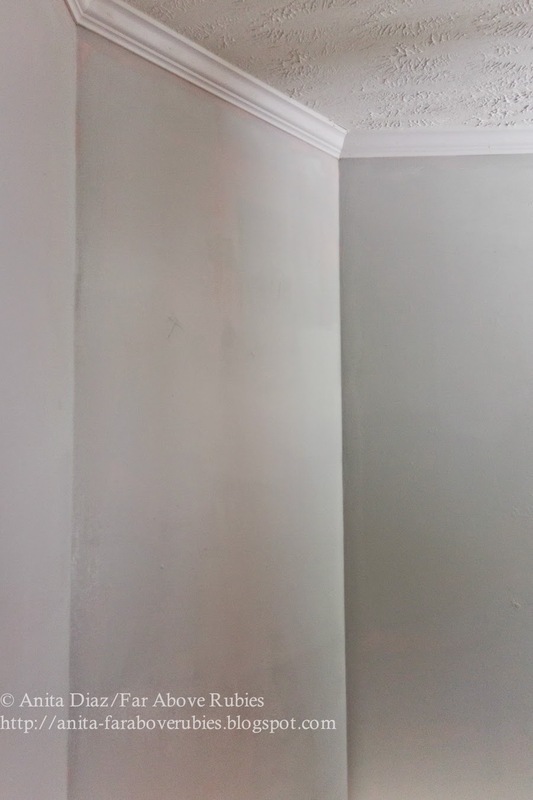 We finally chose a paint color, and it was not easy. I wanted a lighter gray tone, but the light in the room just made them all look either too warm or too blue. We ended up choosing "Persian Seed Pearl" Colorplace at Walmart. 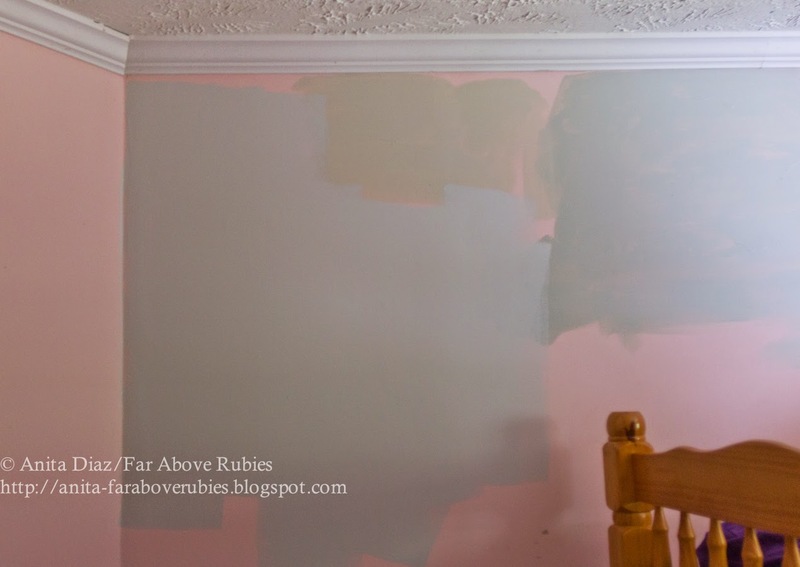 I have to say as pleased as I have been with this paint in the past, and after using expensive brands to compare to, I was very disappointed in the consistency of this one. It dripped and dripped and dripped some more. But, I will say that two light coats covered the pink, and my little helper and I were able to stay on top of the drips. The color is truly fabulous. We all love it and the room looks so fresh, clean and bright now. I am, however, way behind. We have so many other things going on that this project seems to be going at a snail's pace despite my intentions to get it done by Saturday. Several things are ordered and on the way, though. The crystal chandelier should arrive Thursday. It was a bargain at $83 and free shipping. I ordered twin matelasse coverlets and pillow shams. I seriously found a bargain in these twin duvet covers with the colors they wanted, so I will use this fabric as a jumping off point for the rest of the room and see what I can find at my local fabric store that coordinates. I have painted Isabelle's dresser, and it is way beyond what I could have ever imagined. I'm trying not to panic. Really I am--even though I have depleted my already low budget for this makeover, I know I can make it happen. And I'm determined to make it happen because my girls deserve a pretty room. Looking at the bright side, it is coming along, and I'm really excited about how it's going to look when I'm finished--eventually. Anita, I can only imagine how beautiful this room is going to be! That chandelier is gorgeous! I thought of you often, as I was pulling family heirlooms together, for my girls. It really is nice to see those old, familiar pieces being used again! Love that chandelier...excited to see how this room turns out! You should chat with Sweet Melanie about ideas for bedheads.I love natural timber but can definitely imagine the dressing table being painted white.A friend of Melanie's and mine called Gry Cavendish has an armoire as well as other pieces of furniture to give away but I'm not sure where you or Gary are located so you's can collect the free furniture if you are interested.I'm sure that Melanie can put you in touch with him.The chandelier is gorgeous as is the ideas that you already have for the room.Many blessings to you.Lisa Noomford from Down Under South Australia. I feel your pain... I have been doing both girls rooms at once. I will try to show Morgans soon! Looks great so far! Fun to see what you are doing and will be great to see finished room. I love what you have done so far! I recently when through the ordeal (because I must be overly dramatic and call it an ordeal... I just must...) of choosing a light taupe for my living room walls. It was the gray component in the color that was causing all the drama. I finally shucked taupe and did t.n instead. I can appreciate how hard it is to pick a gray!) This room is going to be gorgeous. I just know it. Oh is this is going to be one breath taking bedroom - it already looks so European ! 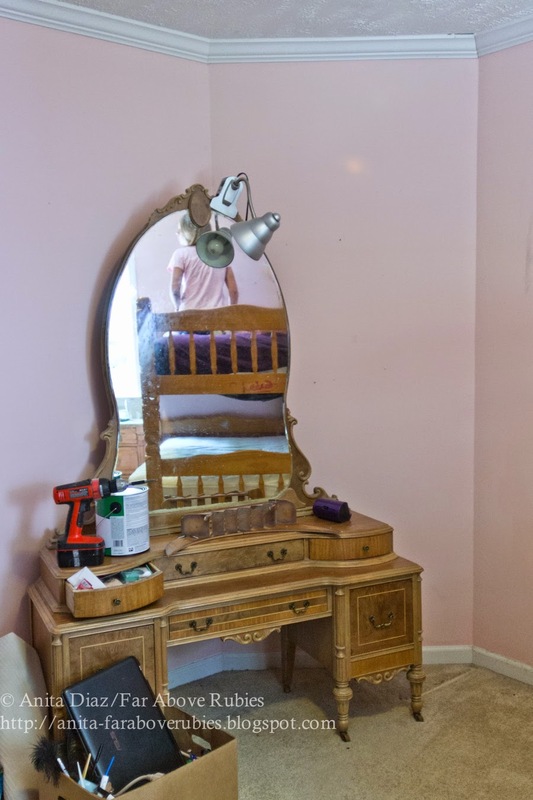 And that vanity has my heart pounding - truly - I almost gasped out loud when I saw - can't wait to see it painted! Looks like you have beautiful plans for the room...it will be gorgeous!